So begins Food World Cup 2010! It wasn’t actually supposed to start just yet, but I some time yesterday doing research and organising company for food adventures. And that night, I happened to be going to a nice restaurant with my work colleagues – both from my team and internationally. It was a great meal, and so why not kick off? 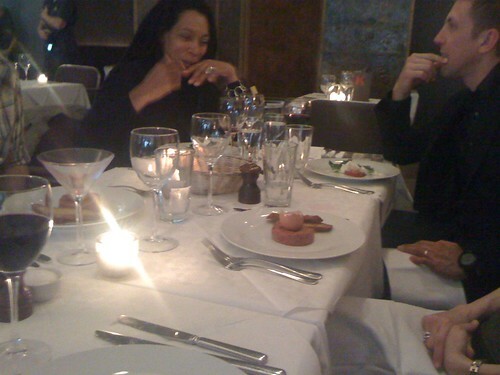 The place is Chez Kristof on Hammersmith Grove, in Hammersmith. The road is a little hidden away from the hustle and bustle of Hammersmith. It’s one of those pretty, leafy streets that I love about West London. The cuisine is French. In London, we are spoilt for French food. They are everywhere. Most trendy restaurant areas have a Cote, a chain of French restaurants. There’s actually one right outside my office building, and we frequent it a lot. There’s Bloody French in Westbourne Grove and my favourite Bar Du Marche in Soho. Of course, most people just catch the train to Paris. Which is a long way for me to say I skipped the French delicacies like Steak Tartare over other things, because I was quite hungry. 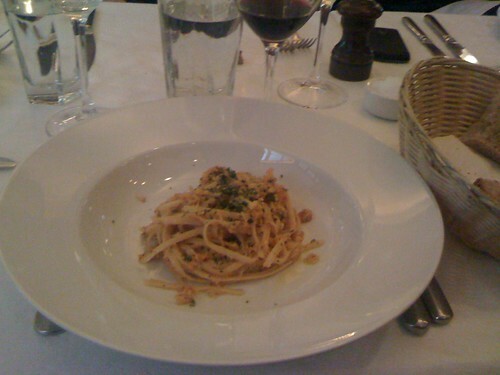 For starters, I ordered the Crab Linguini. Not particularly French, but it was lovely. Some of us ordered the Steak Tartare – which I normally LOVE. Everyone who had it thought the Steak Tartare was lovely. It looked very fine – I’m used to it being a bit more chunky. What I really loved though, was the egg that came with it, actually presented in half an egg shell. For mains, I went for the Middlewhite Pork. It came in a lovely Prune sauce, and a side of spring greens. 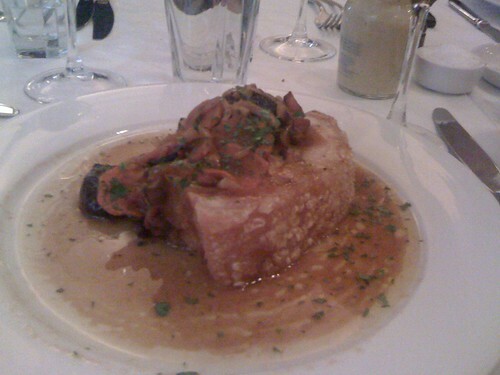 The pork had a whole inch of fat on it – Fabian who ordered the same had to skip it. It’s pretty full on. The crackling was like metal. Which is actually how like pork belly. I really don’t know how French the meal I had was. But it is what French dining in London is like. It’s quite a posh dining experience, and they use British produce. I don’t know if I’ll ever go to Chez Kristof again – it’s expensive and has that generic posh dining atmosphere. Not really my thing if I had a choice. But lovely regardless. This is the first time I’ve really tried blogging about food, having been reading food blogs for a long time. I need to take better photos, and keep a better eye on the menu. I don’t know what the red wine we had was – and maybe that tells you how good it was. I mean, can you really go wrong with a French Red? One down, 31 to go.